For seventeen years, Tolmers Square in north London was the focus of a conflict involving tenant’s groups, community associations, students, squatters, intellectuals, political parties at both national and local level, and property developers. 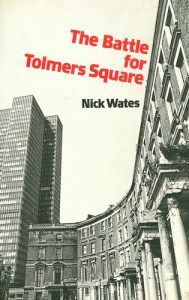 The dramatic story of that conflict is told by Nick Wates, who describes how Tolmers Square became a national symbol of the fight against property speculation and the need for community involvement in planning. The book focuses on one case-study, but the same processes operate in all cities. By tracing the Tolmers case in detail, the book shows clearly the destructive forces which often operate in city redevelopment, and the effectiveness of various forms of campaigning and community action. See also the 2012 Routledge Revivals edition.